With so many video tutorials from talented jewelry designers showing various techniques in jewelry making, which includes beading, wire work, polymer clay, stringing, rochet jewelry, chain maille, resin and various media, you’ll be interested and would want to learn all of them! You’ll also get great tips on different jewelry making ideas and create your own designs, like what I did on my Swarvoski Square Bracelet. I created the bracelet using 2-needle RAW or right angle weaving technique and this is how 1 x 1 RAW is weaved. Using 2 needles, you create 4 sides of the beadwork, crisscrossing the thread on the 4th bead. From the basic 1 x 1 RAW you can then create variations and add beads onto the sides. 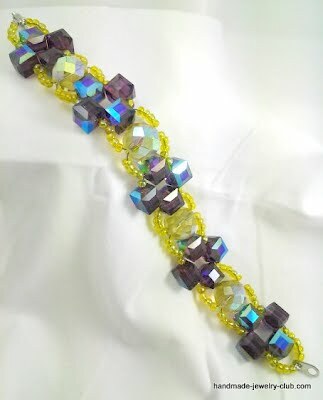 For my Swarovksi Square Bracelet, I added seed beads on each side of the square Swarovski. To create a distinction or separate the patterns, I included a round Swarovski and used the seed beads as its sides, still using the same weaving technique from start to finish. 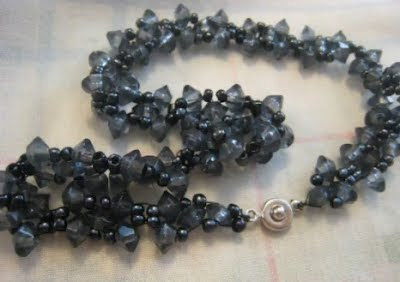 I got this inspiration from watching a video tutorial by gcmasako where she created a beautiful beaded necklace using the RAW technique with black bicones and seed beads. Now, you too can create something similar. 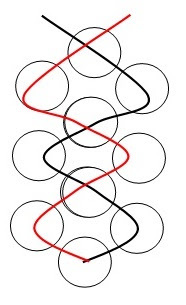 From the basic RAW, you can play with different shapes and colors of beads and create your own pattern. Explore more tutorials with DIY Jewelry Making Magazine #46! Feel that your outfit of the day is just too plain and drab? Want something to kick it up a notch? Then dive into this jewelry tutorials of amazing necklaces that you can make for yourself and also make them as gifts to show them off! !